is the innovative automobile key cutting solution for discerning locksmiths.Miracle-A5 is an electronic three-axe key cutting machine, which operates with state-of-the-art mobile devices such as PDA, Smart phone, UMPC, etc. Cuts the both standard keys and laser keys in one system. Both decoding and cutting are available. -Various kind of mobile devices support. 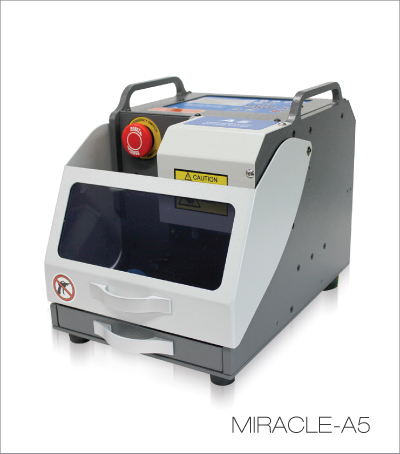 - Able to operate MIRACLE A5 wirelessly. - Manage various kinds of data from key cutting to customer information with the touch of your fingers. - Carry all key data with you wherever you are. - Colored LCD and touch screen ease machine operation dramatically. - Data of a new key can be added easily at any place. - Retrieve and cut keys using embedded LCD and keys. - Hundreds of key data are stored in an internal memory. - It calibrates cutter length automatically. - Exchanging cutter is dramatically easy with its automatic cutter sensing technology. precise key cutting and decoding. 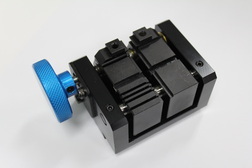 - It holds the both standard key and laser key without clamp change. - Optional battery is available for portable use of the machine. - All range of AC source is supported from 100V to 240V at 50/60Hz. - Bright LED light helps easy night work. - Long life-cycle of LED. - User can add new key data easily. - Users can download new key data from the internet.